The Arts District, a three square mile area, abuts the downtown business district on the west and the Los Angeles River on the east. More specifically, its official city planning board boundaries are: Alameda Street on the west which blends into Little Tokyo, First Street on the north, the Los Angeles River to the east, and Violet Street on the south. On a recent Saturday afternoon, I was exposed to two branches of the Los Angeles Arts District’s gentrification conundrum. First, I went to a book signing for Insider Brooklyn: A Curated Guide to New York City’s Most Stylish Borough. Following that, I met with some LA Arts District artists whose residence spans decades. In the eyes of the Brooklyn author, gentrification offers an opportunity to embrace and contribute to one’s urban environment. In the eyes of LA artists, gentrification is an anathema. 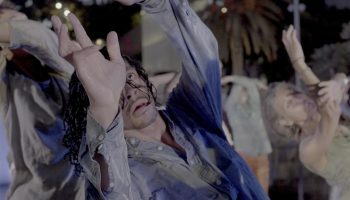 An arts district in LA? Don’t Disney and Hollywood (film and television) define art in LA? No, they define commerce as art. As a transplant from New York, where Greenwich Village, SOHO, The Lower East Side, Tribeca, and most recently Williamsburg and Bushwick have defined arts districts for me, that there should be a specific area in LA designated as an Arts District, on the surface appeared to me when I arrived six years ago, to be both a joke and an anomaly. Now, I need to retract that statement in totality. I have discovered that there is a real “arts district” in LA inhabited by and nurtured by a considerable number of artists along with an emerging group of art galleries, plus home to two relocated West Side museums. One exists; the second is in the process of renovation. In 1981, the Los Angeles City Council passed its “Artist in Residence” ordinance which legalized mixed residential use of what had formally been factories and warehouses. This ordinance legalized what artists had already been doing in buildings that abutted the former Santa Fe Railroad freight terminal. 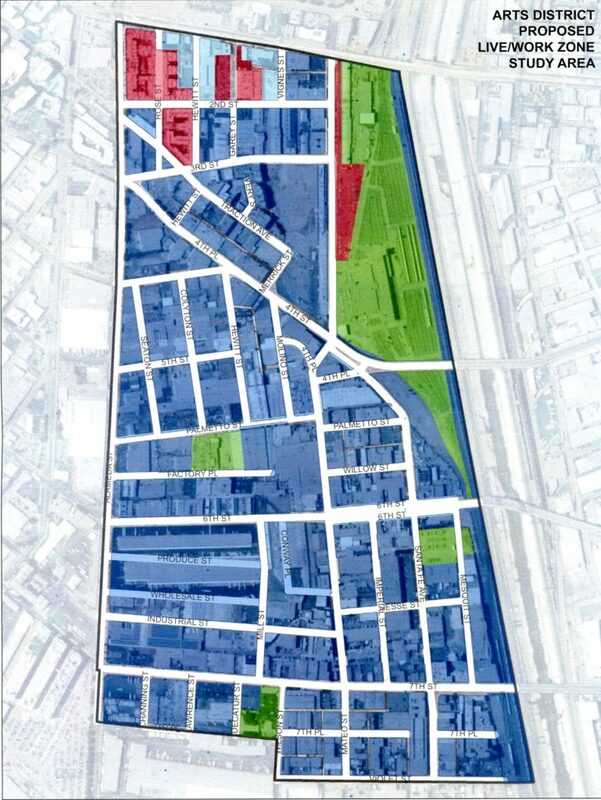 With a considerable inventory of no longer viable factories and warehouses, this ordinance legitimized the established residential/work spaces created by the artist community and provided for expanded adaptive uses within this part of the city. Consequently, a resident community of artists (painters, sculptors, printmakers, jewelers, dancers, writers, poets, and theatrical performers) expanded and continues to flourish today. Through what might be called “sweat equity gentrification,” many artists transformed the spaces that they occupied and consequently the neighborhood. They renovated commercial and industrial spaces and converted them into work/living spaces. They swept the streets and planted trees. They opened stores, bars and restaurants serving their immediate community. They created organizations representing their needs while serving as negotiating agents with the city government. 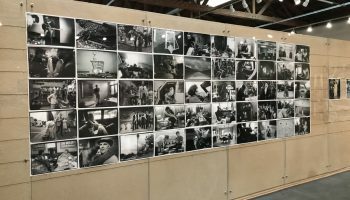 Continuously, for more than twenty years, two local entities have served the artist community: ArtShare LA and LARABA ( Los Angeles River Artists and Business Association). With its wrap around exterior mural, ArtShare LA offers a signature entrance to The Arts District and its numerous exterior murals. Established in 1997, ArtShare LA is an organization and physical entity created to serve The Arts District community. Its “mission is to support artists by providing them with a creative environment in which to reside, develop, perform and exhibit.” It offers a continuous stream of programs and activities: exhibitions, music, theater, poetry and forums. Housed in a two-story 28,000 square foot former warehouse, the ground floor serves as a community programs facility hosting classes, exhibitions and events. The second floor has 30 subsidized live/work lofts available to artists. Cities are organic environments in which neighborhoods are constantly undergoing processes of erosion and rehabilitation. Generation after generation will lay claim to urban agglomerations providing us with a layered awareness of urban history. Recently, Paris rediscovered its vast inventory of 17th century hȏtels particulars (private residences) located in Le Marais. Although occupied, many of the these elegant and elaborate structures were not respected for their architectural quality and structural endurance. In 1976, the Hȏtel Salé, built between 1656 and 1659, was selected as the site for the Musée nationale de Picasso. Previously, the mansion changed hands many times. In 1671, it served as the embassy for the Republic of Venice. In 1815, it hosted a school in which Balzac studied. In 1829, it was home to the École Centrale des Arts et Manufactures and more recently as the municipal École des Métiers d’Art. The Musée nationale de Picasso served as a tipping point in the recent transformation of the neighborhood. In Rome today, Testacio, is its trendiest neighborhood with sushi restaurants, bars and nite clubs. It is the site of a huge garbage dump called Monte Testacio, a 150-foot-tall mountain of discarded Roman Empire era olive oil amphoras, the shipping drums of the ancient world. New York’s neighborhood history could be described by waves of immigrants in this order: Dutch snd British, German and Irish, Eastern European Jewish and Italian, Chinese, African American, Puerto Rican, Dominican, and more recently people from across the globe. Every neighborhood in New York has a layered history. On The Lower East Side, tenements constituting a sizable portion of the current housing stock were built in the mid-19th century to accommodate German and Irish immigrants. At the end of the 19th century, they were claimed by Eastern European Jews and Italians. Also at the end of the 19th century, Harlem’s inventory of brownstones and apartments was built for second generation German and Irish. Around 1915, they began to be replaced by African Americans. More recently, African Americans are being replaced Dominicans. The only New York neighborhood to resist layered transformation has been Manhattan’s Chinatown. The recent gentrification of American urban neighborhoods became a trend initiated by the SOHO effect. SOHO, a neighborhood in Lower Manhattan, hosts a sizable inventory of Civil War era factory buildings with cast iron facades and a smaller number of 1920’s era office, warehouse and factory buildings. In the 1950s and 1960s, artists discovered low rents, moved in and transformed SOHO’s buildings into loft living and working spaces. In its early years, SOHO was a cultural generator. It was the place to be because it was the place where things were happening. It was populated by artists of many disciplines: painters, sculptors, print makers, musicians, dancers, poets, architects, and novelists – many of whom were foodies. Frugal at its initiation, SOHO suggested a new life style that has been imitated globally. So what’s the layered history of LA’s Arts District? First, there were Native American settlements; they were replaced by Mexican ranchos. Historic El Pueblo de Los Angeles, the original center of the Mexican American community, abuts The Arts District. After 1865, with proximity to the Santa Fe Railroad’s freight terminal, what is now The Arts District became a vibrant manufacturing and warehouse area which flourished until new manufacturing processes required more space and container shipping signaled its demise. With generous loft space available at low rents, artists began transforming neglected buildings into attractive studios and living spaces. They volunteered to sweep the garbage off the streets and to plant trees. They created a neighborhood that reflected their sensibilities. It was not their intent to create valuable real estate. 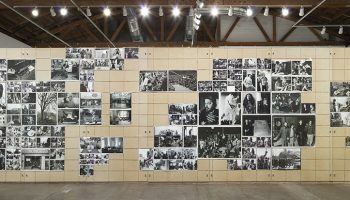 The resident Los Angeles artist community had planted a territorial seed which was recognized and legitimized in 1981, when the Los Angeles City Council passed its “Artist in Residence” ordinance. Over the next twenty-five years, the resident artists could lay claim to what might be described as “their turf / hood.” Touched by the SOHO effect, a transformation was initiated and has accelerated rapidly in the last few years. 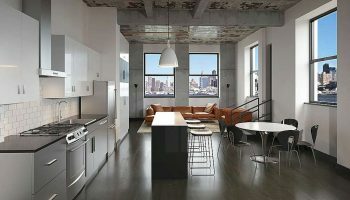 Generational life style changes: loft living, home office, and rejection of suburbia, created an audience who wanted to build on the life style success of the artist/residents. This was not unique to Los Angeles; Miami experienced a similar transformation. Consequently, The Los Angeles Arts District has, in the eyes of real estate developers, become one of the hottest real estate markets in the country. A long term Biscuit Factory resident provided this overview.“One of the most pronounced changes in the district of recent years is the new tenants and owners of live/work units, which were converted by developers in the adaptive reuse process. Those developers initiatives and risk taking facilitated the changes. “The new tenants/owners are, if you examine carefully, the ‘new’ kind of artists.The open, interesting, interested, community oriented individuals who are in large parts small business owners in fields ranging from music, film, internet, photography, food, technology, fashion, services, and a million new categories no one even knew existed. 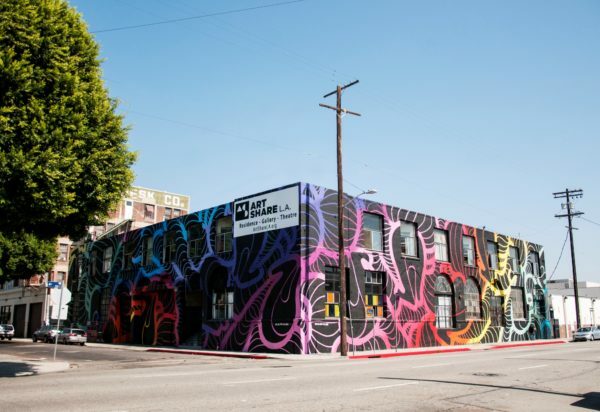 A sequel surveying recent and planned real estate developments plus a listing of the varied artistic, commercial, and industrial enterprises which exist in The LA Arts District will follow in the immediate future. As a life-long Angeleno and 3+ years DTLA resident, I witness daily the mixed blessings of gentrification. This terrific article presents a balanced assessment of our DTLA renaissance. Well-done.